Preheat oven to 350 degrees F and grease a 9x13 inch baking pan (I used a metal pan) with cooking spray. In a medium mixing bowl, whisk all dry dough ingredients together. Set aside. In the bowl of an electric mixer fitted with the paddle attachment, mix melted butter, sugars, and molasses together until well combined. Add the egg and vanilla until smooth. Add in the dry ingredients a little at a time and mix until combined. Spread the dough evenly into the bottom of the pan and bake for 15-17 minutes. Set pan on a cooling rack and allow to cool completely before frosting. Beat butter and cream cheese in the bowl of a stand mixer fitted with the paddle attachment until there are no lumps. Sift in the powdered sugar and beat until smooth. Mix in the vanilla and then a tiny bit of purple or navy food coloring to make it more white. Get the air bubbles out by setting the mixer to stir and allow to mix for 1-2 minutes. 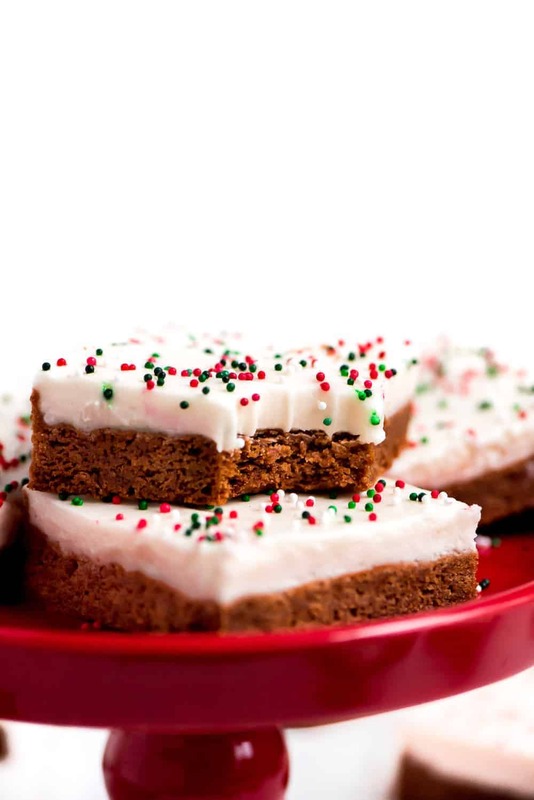 Spread the frosting over the cooled bars and add the sprinkles. Store covered in the fridge.